It’s incredible to think that springs can carry the entire weight of your garage door. Without them, operating your door becomes nearly impossible and poses a major inconvenience. Our company understands that getting your garage door springs fixed properly is one of your top priorities. When it comes to the overall upkeep of your door, you can count on our qualified technicians who use their expertise to diagnose and remedy any problem that you may have with your springs. Learn more about the range of services we provide. No matter the type of springs you have installed on your garage door, you can rely on us to have the competence to repair or replace them. We have the experience to troubleshoot and the fix issues you have with both torsion and extension springs. We use the right equipment and provide all the spare parts, such as the cables, rods and winding cones needed to install your door’s new, functioning springs. Is your garage door too heavy to operate when in manual mode? Or does it appear crooked when it goes up or down? 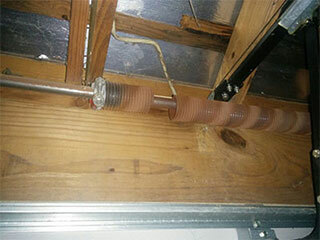 These are some of the obvious signs of broken garage door springs, and you need help fast! When you notice these warning signs and call our company for assistance, we know that nothing less than an urgent response is required. We'll immediately send a technician to your home, and work quickly to have your springs repaired in under an hour. As a homeowner, the temptation to replace your broken garage door springs yourself becomes even stronger when you realize how much some garage door companies charge for what is a very common repair. But attempting any DIY spring repairs can be dangerous if you haven't been trained to do it. Not to mention that you might buy the wrong size springs or install them incorrectly and need to get a professional to fix everything anyway. Avoid making costly mistakes and trust Garage Door Repair Stillwater's skilled technicians who'll save you precious time and money by repairing or replacing your springs right the first time around. Our prices are reasonable and our cost estimates are transparent, clearly laying out all the charges for spare parts and labor. If your springs are giving you trouble, contact our company today for quality professional repairs!